Stream monitoring units (SMUs) are anchored to concrete and placed on the stream bottom. 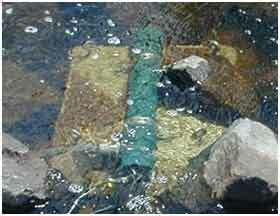 Perforated PVC pipe protects the instruments from rocks and wood moving down the stream channel. DuluthStreams uses state-of-the-art stream monitoring units (SMUs) with electronic sensors to remotely measure streamflow and three fundamental water quality parameters (temperature, specific electrical conductivity EC25, and turbidity). These particular measurements of what we call water quality parameters provide a good indication of a stream's health. This section provides an overview of the key water quality parameters that are continuously monitored in three Duluth streams. Specific details about the precision and accuracy of this data stream are found in the Quality Assurance section. The Chester and Tischer Creek units are powered by batteries recharged by solar cells. The Kingsbury unit is hard-wired at the Duluth Zoo and the St. Louis River unit at the Duluth-Superior inlet to Lake Superior is also hard-wired courtesy of the U.S. Army Corps of Engineers field office in Duluth. Additional water quality parameters are measured in the NRRI or WLSSD Laboratories from water samples collected by staff or by a remotely activated sampler triggered by increased flow at Kingsbury Creek. Two other parameters that are commonly used in automated stream and lake monitoring units are pH and dissolved oxygen (DO). However, these parameters were determined to have a lower priority than the others because of sensor cost and because they were expected to be less dynamic than EC25 and turbidity. They are measured on occasion, manually by collecting samples and for lab analysis, during sampling and maintenance trips. Nutrient and organic matter analyses are also determined periodically. To find out more about pH and DO, and how important they can be, go to our Water on the Web (WOW) sections on water quality, and to the Lake and Stream curriculum modules [2+3] and [4+5].